Two mornings ago—Memorial Day—my wife and I walked down Campus between Monroe and Meade, when she spotted a grey and white crossing the street. Whoa, two new sightings on the same block about 18 hours apart. The other: Siamese seen at dusk on May 28th. 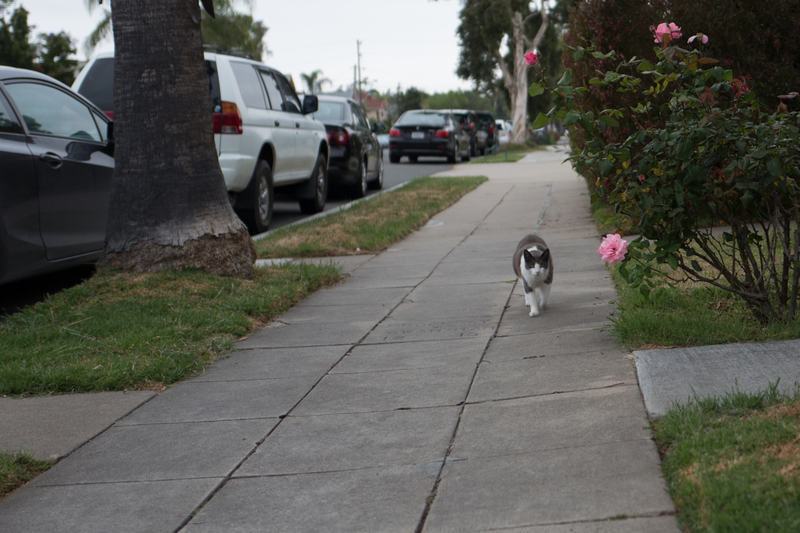 I also ambled to the other sidewalk, and there captured a series of sequential stride shots as the feline approached before turning into a yard (Featured Image). The other is below the fold. Vitals, respectively: f/1.7, ISO 100, 1/800 sec, 28mm; 11:04 a.m. PDT and f/1.7, ISO 100, 1/1000 sec, 28mm; 11:03 a.m. PDT. Both are crops. For a compact camera with fixed lens, the Leica Q‘s focus and shutter response is fast. Easily, the entire series of shots as the cat approached is useable. The morning was overcast, which I consider to be perfect photography weather. At f/1.7, shutter speed was plenty fast enough to stop motion. Both pics are crops, BTW. More from the series: Scruffy, Roly Poly, Woo, Skull, Biscuit, The Colonel, White, Chipper, Frisky, Stretch, Needy, Farfisa, Mates, Hunter, Pee-Pee, Blue, Blue Too, Bonded Pair, Patience, Fess, Jumper, Frenemy, Looker, Cozy, Scout, Lurks, Skit, Mini, Betty, Black and White, Stalker, Bell, Chill, Sammy, Scratch, Poser, Star, Grey and White, Watcher, Herman, Comet, Roman, Willow, Chub, Nimbus, Watson, Lilo, Kit, Pepe, Twilight, Sebastian, Spot, Booger, Ash, Veruca, Riley, Mellow, Bonde, Flower, Glass, Black, BeBe, Fang, Bruce, Siamese, Pounce, Tortie, Haiku, Fraidy, Peso, Daniel Tiger, and Dusk.